Allan Burgess with a small 55c Alvey with stainless steel back. 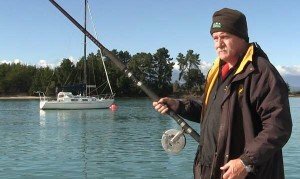 This is an excellent reel for wharf fishing and light surfcasting. Note the rod with two-reel seats. There is a great deal of history behind every reel. They are very tough and last forever! 1920. Charles Alvey produces first 3in and 4in diameter reels in Brisbane. Silky Oak barrels and backs turned on a treadle lathe. Back support and line guide made from cast gun-metal and hand finished. 1923. Ken Alvey (son of Charles) joined the partnership. Increased demand led to the introduction of capstan lathes and full cast gun-metal backs. 1930. Rosewood and Red Bean timbers were used for spool manufacture. A range of game reels was made from Bermabrite (aluminium alloy). 1937. 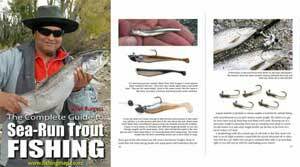 Charles Alvey and Son produced their first catalogue of fishing reels (35 models). 1939. Fishing reel manufacture ceased due to the outbreak of World War II as machinery was adapted to the war effort. 1945. Material shortages after the war saw Camphor Laurel timber used for barrels and spun sheet brass backplates came into being. 1946. Jack Alvey (son of Ken) joined the growing company as a qualified fitter and turner. He produced the first dies for “in-house” compression moulding of bakelite barrels. 1948. Reels up to 5in diameter were mainly bakelite and with the advent of larger reels up to 7in diameter, fine grain Red Cedar was used. A rolled sheet stainless steel back was used screwed to a gun-metal back support. 1960. Marine grade Maple Bondwood up to two and a half inches thick specially made for Alvey was introduced on a range of boat reels and deck winches. 1965. Gun-metal back supports were replaced with formed stainless steel supports which were spot welded to the stainless steel back plate. 1970. Larger compression moulding machines using fibreglass resins made the first fibreglass barrels. 1974. The factory was submerged in the Brisbane floods. Seasoned wood was damaged so timber was replaced totally by fibreglass and bakelite. 1978. Alvey factory was relocated to the present site at Carole Park. 1987. New technology was introduced with the first injection moulding machines. A technically advanced resin Valox from G.E. Plastics Australia was chosen to give new stronger lighter spools with a smooth finish. 1992. New injection moulding dies were made to produce the 4in and 5in graphite back plates with an easy cast system. 1993. A 6in diameter reel was now being produced with the strong light graphite back plate. 2017 July. Closing Down. Alvey announces they are to close down. 2018 April. Alvey Reels Saved. Alvey Reels Australia. Production to continue in Brisbane, Australia.